While Gov. Bobby Jindal flits around Iowa and New Hampshire like an intoxicated hummingbird attacking a jar of fermented nectar, Louisiana suffers a budget collapse at home. Recently, we learned that last year’s budget ended at least $100 million in the red. Medicaid, hospitals, TOPS, and higher education are drowning in red ink, and we’ve heard not a peep from our absentee governor. This is the price we pay for being snookered by a political charlatan: eight years of folly from a man with limitless ambition. Jindal “led” the state down one hole after another. As a result, the next governor has his hands full. Who will take Jindal’s place? Or, rather, who should take his place? Count me as one of the “Anybody But Vitter” (ABV) crowd. Sen. David Vitter will be a mere repeat of Gov. Jindal’s failed leadership. Vitter has been a colossal disaster in Washington, a prima donna senator who puts his personal agenda ahead of the country’s best interest. He’s even scared to take unscripted questions or debate his rivals. Louisiana can’t survive another train wreck like Jindal. I don’t have much to say good or bad about Lt. Gov. Jay Dardenne or Scott Angelle, a Public Service Commissioner. Either man might be better than Vitter. However, neither man is going to land a slot in the runoff, and for the record, both men kept silent as Jindal made havoc of our state. 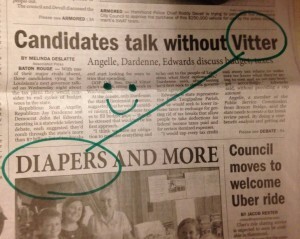 Luckily, Vitter’s cloak of inevitability has fallen away like a cheap rag. Numerous recent polls have declared Rep. John Bel Edwards, a West Point graduate and former Army Ranger, beating Vitter in a runoff. 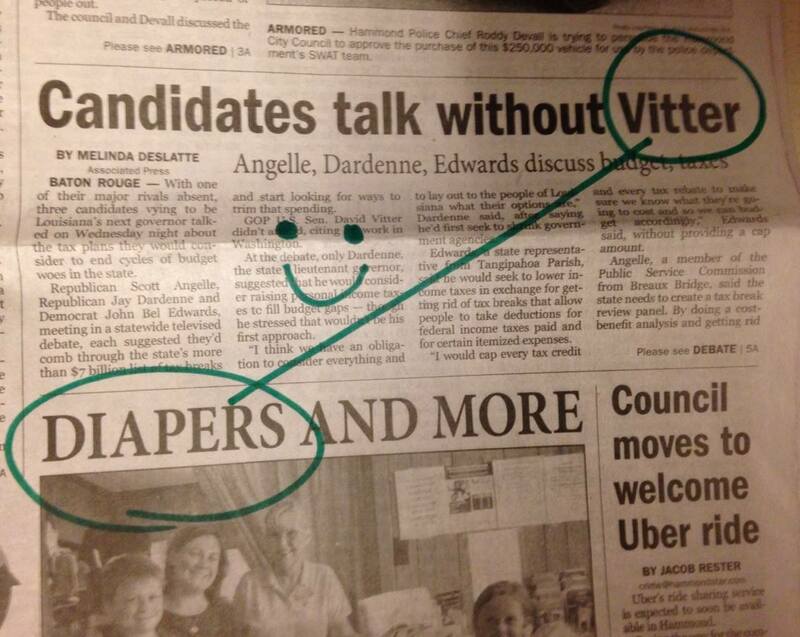 Perhaps citizens have had enough of Jindal and his doppelganger Vitter. Edwards has fought against Jindal tooth and nail for almost eight years while others have been sheepish. He fought to fund K-12 schools, give teachers the tools needed to teach students, keep health and hospitals viable, and to put a halt to Jindal’s budgetary voodoo. I believe past performance is the best predictor of future behavior. I’m pulling for John Bel Edwards for Louisiana Governor. We need a clean break from Jindal’s failed policies. 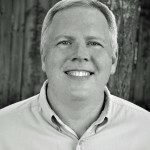 I believe Edwards is our only real option to fix the damage, and lead the state into the future. Photo credit: Front page of the Hammond, La., Daily Star, Oct. 8, 2015. Edwards is THE man. I asked him and his wife why he was running, given that he would inherit ‘Hurricane’ Bobby’s fiscal mess. She said it was a question she asked often. Apparently, his answer to her was basically because a good man needed to stand up against the less than able candates. When I asked Edwards himself the same question his reply was more interesting: He said that actually getting elected and having to figure a way out of Bobby’s mess was something which woke him up at night. To me, those sound like the words of an honest man, not a slimeball politician. As a resident alien (along with ET and the blob from planet X), I cannot vote. However, if I could, I would vote for Edwards. Candour and honesty in Louisiana politics? It would be such a novelty.